I had another post planned for today, but last night, while watching the Emmys, I realized there was a lot to be learned from this classic awards show. I have always been a lover of awards shows, the Emmys, Oscars, Golden Globes, etc. It is a mixture of the red carpet and the fact that I have three hobbies and two of them are watching TV and watching movies. It was also something about the fact that the Emmys felt so exclusive, and I wanted to be a part of it. But unless I moved to Hollywood and roomed with Courteney Cox, I was never going to be invited. Last night while watching Jimmy Fallon slay it as host (singing, playing guitar, and relaying tweets), I went online and saw that there were communities of people watching the Emmys with me. Twitter was overflowing, EW.com was hosting a live blogging of the event, run by one of their writers, but all were allowed to chime in, and my friends on Facebook were posting status updates whenever they were moved. Basically the Emmys went from feeling exclusive to feeling like a community. All because of social media. What’s the take away from my long-winded observation? That everything is more fun in a group. The great thing about social media is it brings a sense of community and allows people to not just watch, but to participate. I would be an irresponsible blogger if I did not challenge you to answer the following question: how can you apply this to your business? I’ll tell you my take. You can make the active decision to use the powers of social media not only to promote your business, but to promote a sense of community amongst your customers. I truly believe that if you can help your customers feel part of your community, you are creating opportunity. Use social media to do this. Don’t forget, a definition of social media is people having conversations online. With this in mind I issue a challenge to all small business owners who are reading this blog. Over the next week brainstorm ideas of how you are going to make this happen, and start taking the steps towards the implementation of your plan. Whether this is setting up a Twitter account, or utilizing your existing account more effectively, change something for the better. Below I offer several of my own ideas, and I hope you will add to them and participate, because I know everyone loves a challenge. Host an open house. If your business has a storefront, decide to host an open house with free snacks and wine. Use Facebook, Twitter, and a blog to draw customers into your store. What you do with them once they’re there is your prerogative. Use Facebook Fan Pages more. Nothing feels more like a community than lots of people “liking” the same thing. For more, read about Facebook marketing. Host at Twitter chat. Give out a hashtag and invite all your followers to join you at a specific time so you can either answer questions, have a conversation, pick your customer’s brains etc. This is a great way to both be useful to your customers or else ask your customers to be useful to you. FourSquare/Facebook Places lets your customers notify your friends when they visit your business and sparks conversation on and off line. Listen to your community. This may seem counter-intuitive to being part of a community, but listen to what your community wants, and you will be a better member of it. If you listen to your customers and deliver, you are more likely to build your community with new members and retain loyal old members. Those are just a few of my ideas. What do you have to add? 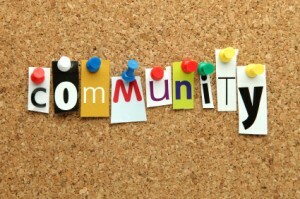 How do you build your community? For an interview with a real life business who tries to foster a community among customers, read about The Needle Shop.